If so, then you will seek to make decisions that line up with and reflect the Gospel. When you do, you don’t have to be ashamed of your course of action, even if it isn’t popular. The context of Romans 1:16 provides a situation that required an unpopular decision to be made, that of including the Gentiles believers into fellowship. Paul concluded that he was “obligated both to Greeks and non-Greeks” (Rom. 1:14). In other passages we can read where this decision to reach out to Gentiles and fellowship with those who believed wasn’t always popular among the believing Jews. Yet, Paul made the decision and followed through on it because it lined up with the essence of the Gospel. Consider the following truths about the Gospel in light of decision-making. 1) The Gospel makes an eternal difference. Consider what kind of eternal difference your decisions will make. 2) The Gospel puts us on the narrow way (Matt. 7:13). Do not make decisions based on how popular they are but on that which follows God’s ways. “For the message of the cross is foolishness to those who are perishing, but to us who are being saved it is the power of God.” (1 Cor. 1:17-18) Remember that “there is a way that appears to be right, but in the end it leads to death” (Prov. 14:12). Sometimes doing what’s right may make us seem foolish to the world, but in the end, it leads to life and goodness. 3) The Gospel demonstrates both the grace and love of God as well as His holiness and righteousness. Make sure decisions reflect love as well as truth. God judged the sin that makes us fall short of His holiness through the death of Jesus because “God so loved the world” (Jn. 3:16). If decisions fail to line up to the standard of God’s holiness, it is not the right decision. But, even if it does line up, we still need to question the decision if it can’t be exercised in love. 4) The Gospel required Jesus to submit to the Father’s will (Lk. 22:42). Always seek after God’s will in any decision that needs to be made, remembering that just because it doesn’t “feel good” doesn’t mean it isn’t right. Jesus prayed, “Father, if you are willing, take this cup from me; yet not my will, but yours be done” (Lk. 22:42). If Jesus wouldn’t have submitted to the most unpleasant event to happen in His life, death on a cross, we would never know the power of the Gospel. And so, we pray “your kingdom come, your will be done, on earth as it is in heaven” (Matt. 6:10) in regard to decisions we must make. Are there any decisions you’ve made that you’re ashamed of? Make decisions that line up with and reflect the Gospel and you don’t have to be ashamed. God’s power will be behind those kinds of decisions. How right you are, Chet. As God’s ambassadors (2 Cor. 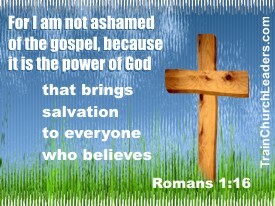 5:17-21), we not only verbally share the Gospel with others but live it out in all we do as a testimony to its power. That obviously begins with even the small decisions we make. Next → Next post: Building Reflect the Glory of His Name?